Logicor's InLine Hot Water System is powered by electricity and is designed to replace your existing water boiler and storage tank in your home. If you also have our Clear Heater System installed it will remove the need for gas in your home altogether. 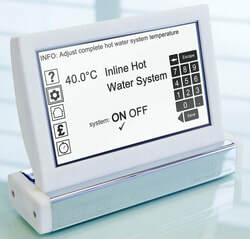 The InLine Hot Water System will complement the Clear Heater System in your home or office by providing efficient hot water on demand, and just like the Clear Heater System you'll have full control of how much you spend on hot water on a daily or monthly basis via the smart Control Panel. Our Logicor InLine Hot Water System is powered by electricity and has been designed to replace the existing water boiler and storage tank in your home; instantaneously, but only heating the water you actually use. Dependent on your system this can eliminate the need for a storage tank; which not only reduces the energy wasted in heating water which is then not used, but the absence of a storage tank and the consequential ‘standing water’ also eliminates the risk of legionnaires’ disease from a storage tank. Although the Logicor InLine Hot Water System can run independently as a “stand alone” unit, it has been specifically designed to work in conjunction with the Logicor Control Panel. As the manufacturer, we recommend that the system is not run without the Logicor Control Panel; however if you also have our Clear Heater System installed, a second separate Control Panel is not required - as both systems can be controlled from the same Control Panel unit. Having both the Logicor InLine Hot Water System and the Logicor Clear Heater System installed in your property may remove the need for gas in your home altogether (dependent on your requirements for cooking and other facilities). As a result, it also greatly reduces the risk of potential exposure to Carbon Monoxide and Carbon Monoxide poisoning. - Maximum heating water volume per day: User defined in litres. Both systems can be controlled from the same Control Panel unit and connecting the Control Panel to Wi-Fi will enable automatic software updates via the internet, which will allow the InLine Hot Water System to be added to an existing Control Panel. The InLine Hot Water System is Bluetooth enabled and also communicates via the electrical ring main in your home or office. In the UK the average energy spend per household totals approximately £1200 per year. The proportion of household energy used for water heating has increased over the last few years and now stands at approximately 18%*. Dependent on your system, updating the way you heat your water by installing the Logicor InLine Hot Water System could not only reduce the energy used to heat your water, but can also eliminate the risk of legionnaires’ disease. Having both the Logicor InLine Hot Water System and the Logicor Clear Heater System installed in your property can also greatly reduce the risk of potential exposure to Carbon Monoxide and Carbon Monoxide poisoning. *Source: Department of Energy and Climate Change (2013), Great Britain’s Housing Energy Fact File. Heating water can be a major part of your energy bills. Do you know how much it costs to heat the water for a bath for example? Read on to find out how much you could be saving. Building Regulations state that from 6th April 2010, all new-build homes across England and Wales after must have devices fitted to baths to limit the temperature of the water to 48°C. That temperature is still more than hot enough for domestic use, but it removes the potential for the most serious scald injuries to happen. 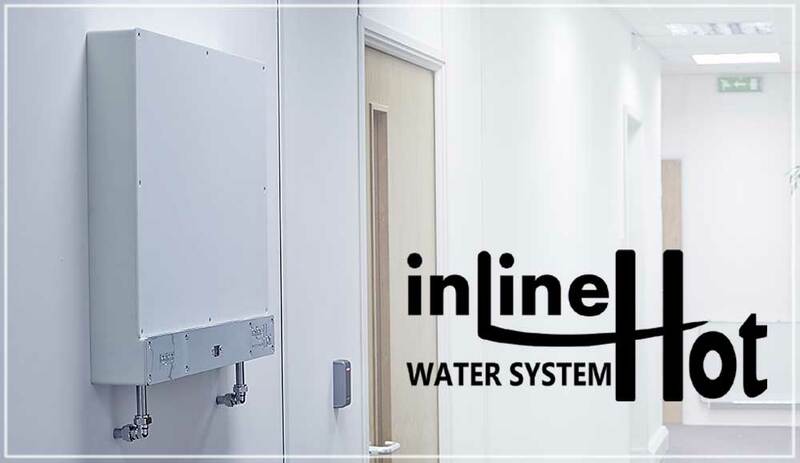 The InLine Hot Water System fully complies with the Building Regulations 2000, Approved Document G – Sanitation, hot water safety and water efficiency. The control panel is the ‘brain’ of both the Clear Heater System and the InLine Hot Water System. Existing Clear Heater customers will be able to use their current smart control panel to monitor and change the settings of the new system. Automatic software updates via the internet will allow the InLine Hot Water System to be added to an existing control panel. The control panel communicates with the each heater unit via the electrical ring main in your home or office. The control panel is pre-programmed to work out of the box but you can change the settings at any time with your own preferences. For example, you can change the name and temperature of each heater unit or assign heater units to work in named zones (e.g. all bathrooms). The control panel is also equipped with Wifi capability to receive software updates via the internet and will soon have the ability to connect via your Smartphone or iPad.